Please refer to our stock # 3258 when inquiring. 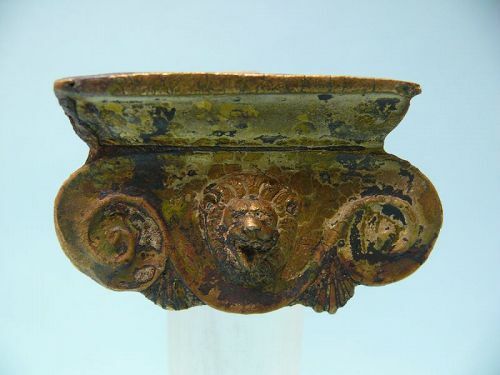 Roman Bronze Iconic Style Capital with Lion Head motif, ca. 1st - 2nd Century. Shipwreck artifact with patina from the sea. 1 3/4" x 2 3/4" x 2 1/4". On custom lucite stand height is 7". In excellent condition. Ex: Archaeological Center, Jerusalem. The Ionic order forms one of the three classical orders of classical architecture, the other two canonic orders being the Doric and the Corinthian. There are two lesser orders: the Tuscan (a plainer Doric), and the rich variant of Corinthian called the composite order, both added by 16th-century Italian architectural writers, based on Roman practice. Of the three canonic orders, the Ionic order has the narrowest columns. The Ionic capital is characterized by the use of volutes. The Ionic columns normally stand on a base which separates the shaft of the column from the stylobate or platform; the cap is usually enriched with egg-and-dart. Since Vitruvius, a female character has been ascribed to the Ionic (in contrast to the masculine Doric).